Guest: William (Bill) Harwood; Topics: Space news, policy, & notable events now & throughout our space history. Please direct all comments and questions regarding Space Show programs/guest(s) to the Space Show blog, http://thespaceshow.wordpress.com. Comments and questions should be relevant to the specific Space Show program. Written Transcripts of Space Show programs are a violation of our copyright and are not permitted without prior written consent, even if for your own use. We do not permit the commercial use of Space Show programs or any part thereof, nor do we permit editing, YouTube clips, or clips placed on other private channels & websites. Space Show programs can be quoted, but the quote must be cited or referenced using the proper citation format. Contact The Space Show for further information. In addition, please remember that your Amazon purchases can help support The Space Show/OGLF. See www.onegiantleapfoundation.org/amazon.htm. For those listening to archives using live365.com and rating the programs, please email me as to why you assign a specific rating to the show. This will help me bring better programming to the audience. 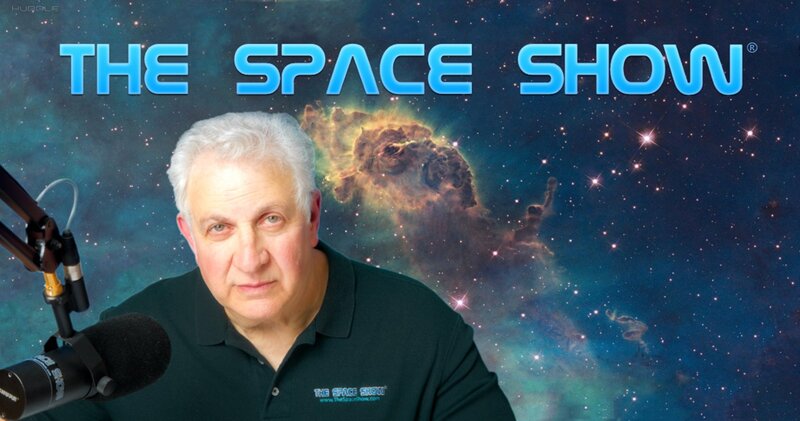 We welcomed Bill Harwood of CBS Space News back to the show for this 92 minute discussion. During the first segment, I asked Bill for a bit of his personal history going back to when he first started doing space news with UPI. Next, I asked him what over the years has impressed him the most regarding space activities. Don't miss what he had to say about this as multiple space events were on his list. In addition, I brought up the Planetary Society success with LightSail, their solar sail demo project. Bill talked about the mission, what is planned next for a larger, more lasting solar sail project, and the fact that The Planetary Society funded the $4.5 million cost from contributions by Planetary Society donors. Also in the news was the NASA "flying Saucer" which was really the demo of a new landing system for Mars using a huge (the largest ever) supersonic parachute 100' across. Bill went into detail on the mission, even how it got tagged a "flying saucer" which he said was the responsibility of the media. Listener Robert sent in an email asking for Bill's position on the Moon-Mars debate. Bill talked about benefits from both positions but did not share his personal preference as he wanted to stay strictly with reporting the news, not offering an editorial. That said, his discussion of the debate and the pros and cons of each side was most interesting. We talked some about planetary missions but honed in on New Horizons and Pluto. Also mentioned was the upcoming Europa Mission, then listener Carolyn asked him what he saw for human spaceflight over the next few years. Ben wanted to know if the private sector could take us back to the Moon. Bill had much to say about the emerging commercial industry but in the end suggested that the costs were so high along with very high risks that government would be the one to do it for a long time to come. Don't miss what he had to say about both costs and risks. Russia and their hardware issues came up, then we had quite a discussion on commercial crew, not fully funding it, and continuing to pay the Russians rather than getting the job done with American providers. John from Ft. Worth gave us a call to talk about the SpaceX subsidies for Falcon 9, wondering if the price of a Falcon 9 launch was the true launch cost or a subsidized cost. John and Bill had an interesting discussion on this with a few added comments by yours truly. John also used the time to repeat his position that going to the Moon was essential before going to Mars and that SLS was likely a place holder for labor and technology until we have a different space policy with different space leadership. Bill talked about variables and lots of unknowns, including wild cards from China and other sources that could end up driving U.S. space policy and progress. In the second segment, we talked about public private partnerships citing SpaceX as a good example of such a partnership. That said, Bill talked about the need for the commercials to have a destination such as the ISS for their goods and services but that is harder to realize with planetary missions. He said their needed to be something to do with the means to do it. This brought us to a space infrastructure discussion and the possible role of the government in building and paying for space infrastructure, especially to support industrial growth. Bill then address risk in much more detail. This is a discussion you don't want to miss. We talked vehicle safety, Virgin Galactic, deep space missions, and much more. Barbara in Chicago asked Bill about frustrations and how the frustration level has changed over the three plus decades he has been covering space news. Bill took a few questions about the ISS and the potential closing of it in 2024. He was asked if we were in a space race with China and did not realize it. Carl inquired about the Indian space program, then Bill talked some more about the CST-100, the Dragon, remodeling the ISS for Independent Docking Adapters for the two vehicles and he even responded to a question about Dream Chaser. More was said about the ISS, plus he told us he met a person at NASA who was in charge of figuring out how to deorbit the ISS which weighs about 900,000 lbs. and moves at 5 miles a second. This is in advance of a probable 2024 termination date. In his closing comments, he said the public needed to let Congress know about their support for space. He also reminded us that space was dangerous, costly, and very risky. Before the show ended, I asked if he had seen rockets blow up on the pad. He had and he shared a few stories with us. Please post your comments/questions on TSS blog above. If you want to email Mr. Harwood, you can do so through me.